Director – Owen Hurley, Screenplay – Elana Lesser & Cliff Ruby, Story Development – Rob Hudnut, Elana Lesser, Sarah Maizes & Cliff Ruby, Based on the Fairytale by the Brothers Grimm, Producers – Jesyca C. Durchin & Jennifer Twiner McCarron, Music – Arnie Roth, Animation Supervisors – Sebastian Brodin & Gino Nichele, Production Design – Walter P. Martishius. Production Company – Mattel Entertainment/Mainframe Entertainment. Barbie is painting with her young friend Kelly. Kelly doesn’t understand how to use her brush and so Barbie tells her the story of Rapunzel. Rapunzel was kept a prisoner by her stepmother Gothel in a manor in the woods that was surrounded by a magic barrier. Her only friends were the young dragon Penelope and the talking rabbit Hobie. One day Rapunzel found a hidden tunnel that led to the outside world. Enjoying her freedom, Rapunzel roamed until she eventually came to the local village. There she met Stefan, unaware that he was the prince. Back at the castle, Gothel learned from her weasel companion Otto where Rapunzel had been and demanded that Rapunzel tell who she had been talking to. When Rapunzel protested that she genuinely did not know, Gothel created a magic tower to imprison her. There Rapunzel found that the hairbrush left by her parents had transformed into a magic paintbrush and that with it she could create paintings that she could walk into. She was thus able to leave the tower and meet Stefan again. He invited her to the masqued ball being held for his birthday. When Gothel learned what had happened, she snapped the paintbrush and raised the tower even higher. She then cut Rapunzel’s long tresses and placed them on herself so that she could impersonate Rapuznel at the ball. 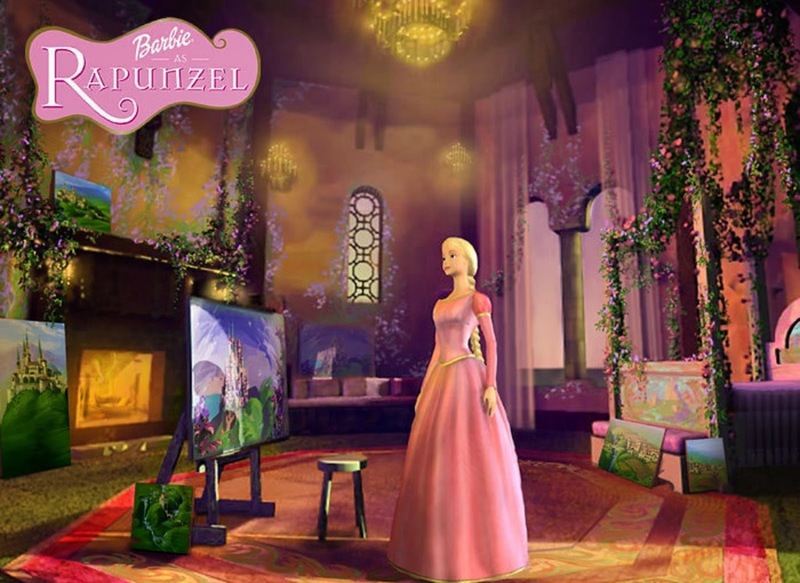 Barbie as Rapunzel was the second of the films based on Mattel’s best-selling Barbie doll made by the Canadian computer animation company Mainframe Entertainment. Mainframe and Mattel had first made Barbie in the Nutcracker (2001) and subsequently went onto a whole host of these that so far include Barbie of Swan Lake (2003), Barbie as The Princess and the Pauper (2004), Barbie Fairytopia (2004), Barbie and the Magic of the Pegasus in 3D (2005), Barbie in The 12 Dancing Princesses (2006), Barbie Mermaidia (2006), Barbie Fairytopia: Magic of the Rainbow (2007), Barbie as The Island Princess (2007), Barbie & the Diamond Castle (2008), Barbie in A Christmas Carol (2008), Barbie Mariposa (2008), Barbie and the Three Musketeers (2009), Barbie Presents Thumbelina (2009), Barbie: A Fashion Fairytale (2010), Barbie in a Mermaid Tale (2010), Barbie: A Perfect Christmas (2011), Barbie: A Fairy Secret (2011), Barbie: Princess Charm School (2011), Barbie in a Mermaid Tale 2 (2012), Barbie: The Princess & The Popstar (2012), Barbie and Her Sisters in a Pony Tale (2013), Barbie in The Pink Shoes (2013), Barbie Mariposa and the Fairy Princess (2013), Barbie and the Secret Door (2014), Barbie: The Pearl Princess (2014), Barbie and Her Sisters in the Great Puppy Adventure (2015), Barbie in Princess Power (2015), Barbie in Rock’n’Royals (2015), Barbie and Her Sisters in a Puppy Chase (2016), Barbie Spy Squad (2016), Barbie Star Light Adventures (2016), Barbie: Dolphin Magic (2017) and Barbie: Video Game Hero (2017). In many of these, Barbie plays the central role in the re-enactment of a fairy-tale. With Barbie as Rapunzel, Mainframe adapt the Brothers Grimm fairytale, originally published in 1812. The story of the fairytale is well known – Rapunzel is given to an evil sorceress by her parents in payment for a misdemeanour, grows up imprisoned in a tower that has no egress except for a window at the top until a handsome prince comes by and she allows him in by lowering her long hair to the ground so that he might use it as a ladder to climb up to her. 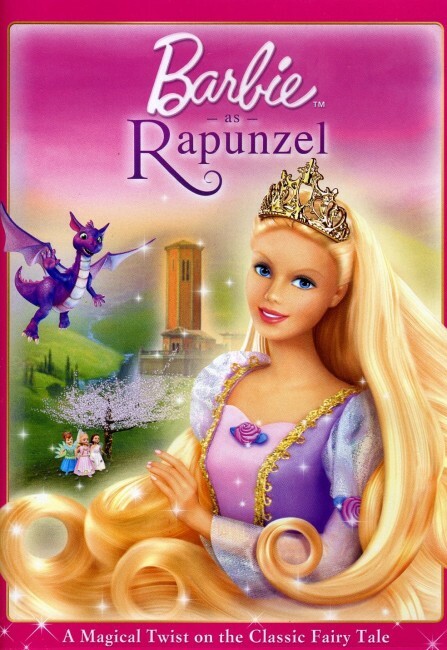 It should be noted that Barbie as Rapunzel varies considerably from the Brothers Grimm version. Mainframe take the basic elements of the original – the orphaned daughter raised by the evil sorceress, her imprisonment in the tower, the handsome prince, Rapunzel’s long hair – but weaves them into a new story of their own making. The story has now been expanded to include dragons, magic paintbrushes that have the ability to create paintings that become portals, wars between kingdoms and Rapunzel even being a princess of one of the realms without knowing about her heritage. Indeed, the original has been so changed that Rapunzel never gets to lower her hair to let the prince into the tower throughout – for that matter, her tresses are of little relevance to the story. The famous line “Rapunzel, Rapunzel, let your hair down,” is uttered – but this only takes place in a dream sequence. There seems a generic arbitrariness to much of the rest of the film. The witch’s reason for imprisoning Rapunzel in the tower is the contrived one of punishing her because Rapunzel is unable to tell her the name of the man she met in the township. The magic seems random and far too easily won – the hairbrush from Rapunzel’s parents turns into a magic paintbrush that paints scenery that she can walk into and escape; Rapunzel finds she can escape her imprisonment in the tower because the witch has included the condition that the tower is to imprison liars and she has never told a lie. On its own terms, Barbie as Rapunzel is a likeable film. The characters have the glassy blankness that all Mainframe’s animated films do, but once the film arrives in the outside world the scenery is shown with a degree of colour and some nice sets. (Occasionally the animation comes with a few cut corners – when the witch drinks a cup of tea in bed, we clearly see the cup not even meeting her lips). There is also a likeable line-up of cute talking animal sidekicks.